The large, five-line initial 'D' opens Psalm 109: “Dixit dominus domino meo. Sede a dextris meis...”. This expressive, wonderfully detailed miniature is a fine example of Ferrarese illumination at the end of the Quattrocento. The initial D on this splendid page opens Psalm 109: “Dixit dominus domino meo. Sede a dextris meis...”. The poetic text conveys a meaning on two levels accessible through an interpretive process. King David, the composer of the Psalm, complains to heaven about his enemies and appeals to God, praying for the destruction of his enemies. It is unknown to which enemies the Psalm refers. Presumably it alludes to David’s son Absalom who rebelled against him. The poem is also thought to refer to Christ, his sufferings, betrayal and persecutors, as if in a prefiguration (109:8). The first verses hint at Christ’s exaltation and everlasting priesthood (sit to my right...). In singing this Psalm, one could find comfort in believing in the destruction of all enemies of Christ and his Church, knowing that salvation comes to all who trust in God. Similar to the text, the meaning of the miniature also operates on two levels. 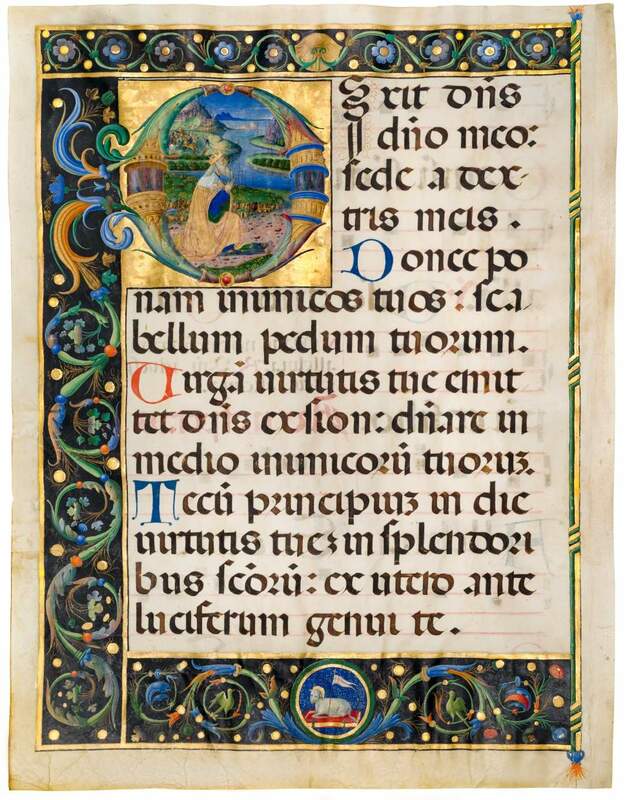 The large, five-line initial D is composed of green-bluish foliage, architectural elements, and precious stones set on a highly burnished gold ground. Framing the page is an extremely fine, three-sided border of elegant feather-like acanthus leaves with handsome flowers, fruits, green and bluish leaflets, and birds in golden outlines, all on a field of black and with many golden bezants. In the centre of the lower margin, a roundel displays the Agnus Dei, the Lamb of God with a banner and lying on a book. This is the sacrificial lamb, a visual representation of Jesus ‘slaughtered as an innocent lamb’ but risen in victory – as celebrated on Easter. Within the hollow space of the initial, King David kneels. The elderly king is expectantly looking up to heaven, not joining his hands in prayer, but pleadingly directing his left hand to himself and pointing the fingertips of his right hand to heaven, beckoning God to appear. The path on which he kneels is strewn with a multitude of coloured stones and is set within a wider, beautiful landscape with green meadows and mountains in the distance. Although bushes are green, empty stakes or trees without leaves suggest a late winter season. From the middle to the distant horizon, the view is dominated by a winding river painted in various shades of blue and bordered by land. To the left, a battle scene rages, while further away dead men’s bodies litter the green expanse in front of the walls of a fortified town. It appears that a single person chases away an entire equestrian unit. This is not a reference to any traditional depiction of the battle between the young shepherd David and the giant Goliath, but a sophisticated interpretation of the text of Psalm 109 as explained above. Although the talented illuminator remains anonymous, this leaf is undoubtedly a very fine example of Ferrarese illumination at the end of the Quattrocento.